Saw this at Costco Casula. Has not seen this model under $2500 before considering it's 65" OLED with dual tuners and Ultra HDR. Spoken to the store manager and been told their head office has asked them to clear out old stock to make room for new 2019 stock and as I walked around I could see the new Samsung 2019 QLED R series on unpacked pallets in the back isle. Stock is very limited as only 1 unit left at Costco Casula. The manager has told me they're not allowed to make reservation or payment for members over the phone so if you want to buy one then better make a run for it. Call your local Costco warehouse to check stock before you head down. Good luck to anyone who try to beat this deal at their local HN, JB or TGG. Membership can be returned any time within the 12 months period and can get full $60 back. Hows this oled compare to LG and Sony? Not many reviews out there and never owned any Panasonic before. The software onboard any good? Can't beat the Panasonic. Love mine! Smart features are quite poor compared to others. Picture is probably the best out of all OLEDs, at least the FZ1000 was over the Sony and LG. Don't believe there's any difference in PQ between FZ1000 and this one. Sony is too dim even for OLED but has the best motion, LG has very oversaturated colours and poor motion. Panasonic is the best all rounder. That's great thanks for the write up, more positive on Pana now. My understanding is all OLED TV's are using LG screens as LG are the only manufacturers. So PQ is down to the different electronics in each brand? @ideasman: Don't worry about DolbyVision if you are thinking about going Sony instead of this. The Sony TVs implementation of DV is completely flawed and looks worse than on the Panasonic even though the panasonic only does HDR10. HDR10+ is coming in a firmware update. The Panasonic colour is so accurate, we use them as grading monitors, and they perfectly match our $30,000 Sony monitors as far as colour reproduction goes. If you like accurate colour, the Panasonic is the best of the bunch, brighter than the Sony, and better colour than the LG. The sound is good, but not as good as the FZ1000, but really, if you are going with a TV of this calibre, surely you will run a decent surround system to go with it. I'd couple it with an AppleTV 4K and run the apps via that anyway, Infuse on the ATV4K lets you run UHDRips flawlessly. HDR10+ is coming in a firmware update. market spoke - 2019 models have Dolby Vision. @AlexF: when r they expected ? @Scrobo: Solid info. Will be getting a Pana when I upgrade now. The only difference in the models is the Technics sound bar in the more expensive version. Picture is identical in both models. did you confirm with the manager this deal was nationwide? Yes the store manager confirmed this is nation wide as they're expecting to make room for new 2019 models from Samsung and Panasonic. You should get the same discount at any Costco warehouse for the same item if stock is still available. Almost bought the 55" fz950u yesterday price matched at jb. After using it there I found that the user interface is dated as is the remote. Also noticed burn in on the demo monitors albeit after 10 months of the same watermark but it was quite severe. I'm going to go samsung qled for interface and longevity if I can ever get a good bargain! The interface just isnt pretty or smooth like lg … but its functional and snappy. No lag like in android units. I would definitely not get a display model oled. Yes neither would I, this was for a new one. I also didn't buy because I couldn't find if it provided apps or functionality to natively play google play movies and also if I did have some sort of internet TV box, we are known to leave on accidentally from time to time and the chromecast screen saver HUD could cause burn in after time. I would only if the price is right and they let me check the hours. Thanks, I have seen these. I'm self employed so no access to epp. What price were JB going to sell it to you before you decide against it? We tend to keep TV's for longer than 5 years so I'd still go qled for longevity and no colour fade. I don't mind the basic interface. It's lean and snappy and does the job. I've already got an NVIDIA Shield and that takes care of any smart functionality. Auburn Costco has 4 units available. Oh that is so interesting. Thanks for that. Currently have 2 x 55 inch panasonics that are never going to die as they both perform so well. Might continue on the panasonic bandwagon when one of these eventually dies and I let myself buy a 4K. Thanks, great information. I too have a Panasonic 65 inch plasma and the picture quality is still the best after viewing some TV broadcast contents on the LEDs at the good guys on Thursday. 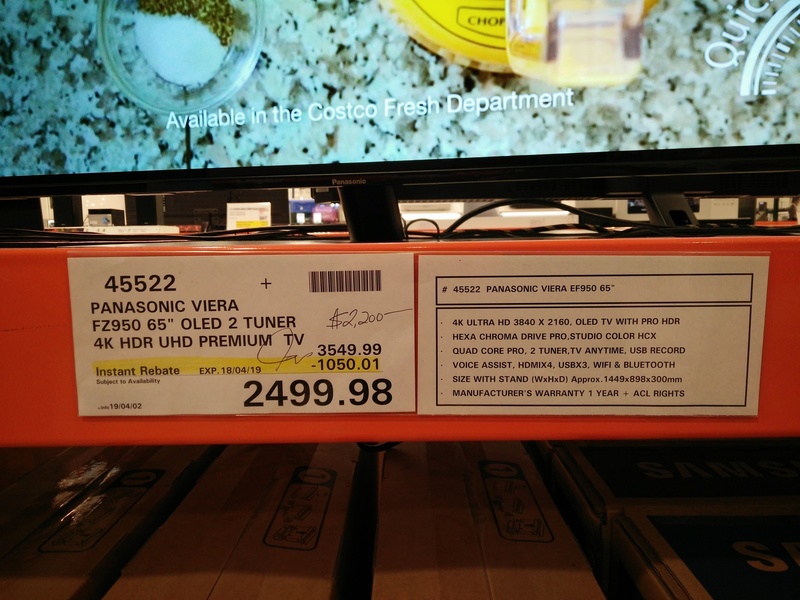 They wanted $2.5k on a Samsung 75 inch lcd screen. I love the size but the picture is a let down. Great Deal! Bought one of these 6 months ago for around $3,600, amazing TV to replace my 6/7 year old reliable 50" Panasonic ST50A Plasma. I'm a huge fan of the Panasonic TVs. Once you go OLED, you can't go back to LED/LCD, or anything else for that matter! Getting rid of mine was so hard, but 4k and 65" vs 1080p and 50", it was time to upgrade. At least a friend bought it who would make good use of it! Don't mention it if the stock is inferior. 750 nits peak brightness is 'ok' probably best to wait for a 1000 nits though to cover HDR10+. All these mixed standards are so annoying and misleading. The display unit at Costco Casula is still available to purchase for $2,200. Check your local Costco warehouse if interested. Would you be willing to give us access to the receipt?